A quickie update today because I’m changing more things around on Snomie. I’m sure many of you noticed I’ve been offering out a mini course of 3 free trick tips videos taken from our Snowboard Trick Secrets course to anyone who visits Snomie. The video series did really well, except the thing I didn’t like is a lot of the people going through the trick tips were brand new to Snomie.com and pretty much just had a bunch of tutorials immediately shoved in their faces. I’m not too happy about that since I don’t believe trick tips by themselves work. It often requires a combination of trick tips + coaching to get past a lot of problems that stop people from learning freestyle, so it was kind of missing in the coaching department. I’m a big fan of building a real relationship with our readers and being a real person to help when you get stuck with your snowboarding, so I’ve decided to re-do our free trick tip series. This time instead of just being copied straight from our Snowboard Trick Secrets course, they’ll be created properly to not only give some trick tips but also show that here at Snomie it’s also about the support and 1:1 relationship we build with our readers to help them continue to improve beyond just the trick tip. In the meantime, our Snowboard Trick Secrets course is still open for new members with a limited time 50% discount. If you’re interested in joining, you can check it out here. I’ve been busy finalizing the last bits of the new Snomie homepage between sessions of editing our upcoming trick tip videos. It may still change a little, but that’s basically the layout of the top half of the new homepage. As you can see it’s a heck of a lot cleaner than our current blog homepage and I can funnel new people to the right guides/tips more easily. Besides these things, we’re still chugging along with editing the spinning, jibbing and buttering trick tip videos and I’m looking forward to getting them out and released for you guys. ps: For those ready to take their freestyle to the next level, you can apply to join our members only Snowboard Trick Secrets program here. A quick update for you guys today on where we’re at with our snowboard trick tips videos and our courses/trainings we have coming up. As you guys know I’m creating a set of 3 trick tip videos for spinning (180s/360s), jibbing (50/50s, boardslides etc), and flatground/butter tricks. These videos will be released as part of our Snowboard Trick Secrets online video tutorials once they’re done. Everything was filmed up on the spring terrain park at Whistler Blackcomb this month and it was close, but we did manage to film the last batch of clips we needed on the closing day of the spring season. Hooray! The time limit with the mountain closing was the one thing I was worried about since our film crew is based in Whistler and we had a very limited amount of time to get the clips we needed, so it’s good we got it done on time. Now that we have the footage it’s a matter of cutting and editing all the video clips together. The goal for the next month is to basically get all 3 trick tip videos edited and released as soon as possible. When they’re done I’m hoping they’ll be the most comprehensive and detailed snowboard trick tip videos available anywhere. As announced previously, I’m also creating a set of intermediate to advanced snowboard turning/riding tutorials to go with our basic beginner snowboard lessons. These videos will cover things like carving and advanced turning techniques. Unfortunately, we’ve had to push those tutorials back until the start of next season (Nov/Dec-ish). The reason for this is because of the bad snow conditions on the Whistler Blackcomb glacier this year. It was a rough spring season and what snow we did have was very poor. I didn’t mind the rough conditions for recording the freestyle tutorials because a jump is a jump, but I wanted the turning tutorials to be on the type of terrain you’d be riding in winter, instead of nasty brown and patchy glacier snow. So that means I’ve scheduled the intermediate/advanced riding tutorials to be the first project I record/edit when the N. American winter starts at the end of this year. 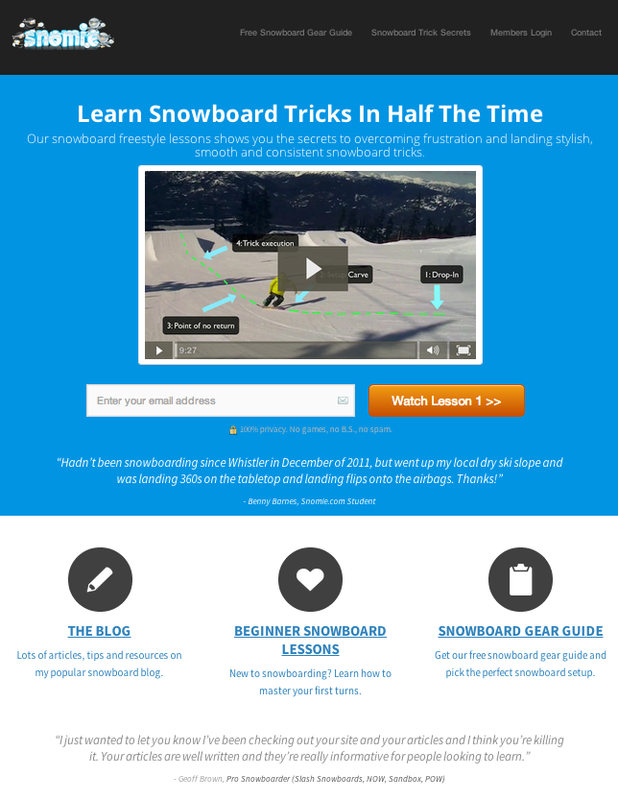 The public release for our Snowboard Trick Secrets online training is going very well! Those of you already in the program can expect more people joining from the end of this week onwards as they finish up their free lessons and get a chance to join the full VIP area. ps: If you haven’t already, make sure to check out our free snowboard freestyle lessons if you want a chance to join our Snowboard Trick Secrets training group and take your riding to the next level. He’s allowing us to give away 1 free trick tip tutorial dvd to a lucky Snomie.com reader each month and it’s time to give away this month’s trick tip dvd! These are the number #1 selling snowboard trick tips online with over 17,000+ copies sold every year. How many days did you ride last year and how many days are you hoping to ride this year? Entries close July 8th 2013. Winner will be randomly selected and announced below on July 9th. Please make sure you use a real email address when commenting or we can’t contact the winner to send you your prize. 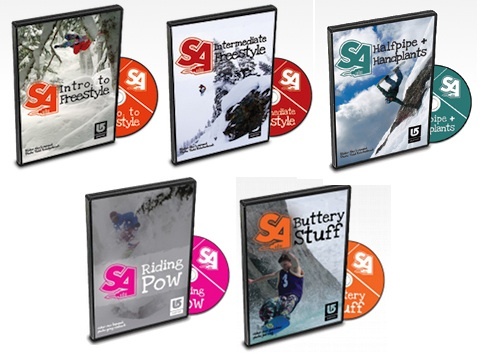 Any of the following Snowboard Addiction DVD trick tips: Intro to Freestyle, Halfpipes & Handplants, Buttery Stuff, Getting Upside Down, Jumping Vol 2. I’m happy to announce our ‘Snowboard Trick Secrets’ freestyle snowboarding course is live! If any of the above sounds interesting or you want to know more about the course, check out the intro video here. As thanks to our regular readers who have supported this website for 2 years, I’m doing a special discount for 4 days. You have 4 days to grab this course for a fraction of what I’ll be charging later. After 4 days, on June 12, the sale will end and I’m taking the course offline. If you have any interest in this training course, you have until June 12th to join the course at this discounted price. Have you ever made your own snowboard video edit before? Why/why not? Entries close June 8th 2013. Winner will be randomly selected and announced below on June 9th. Any of the following Snowboard Addiction DVD trick tips.